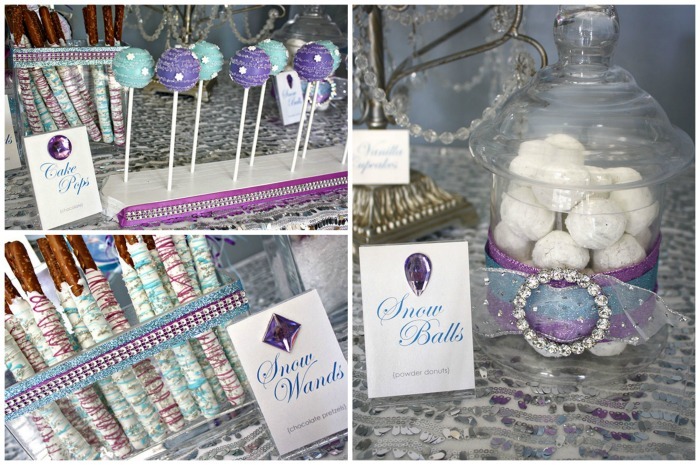 We have a super adorable Frozen party for you today lovelies from Rachel J Special Events! 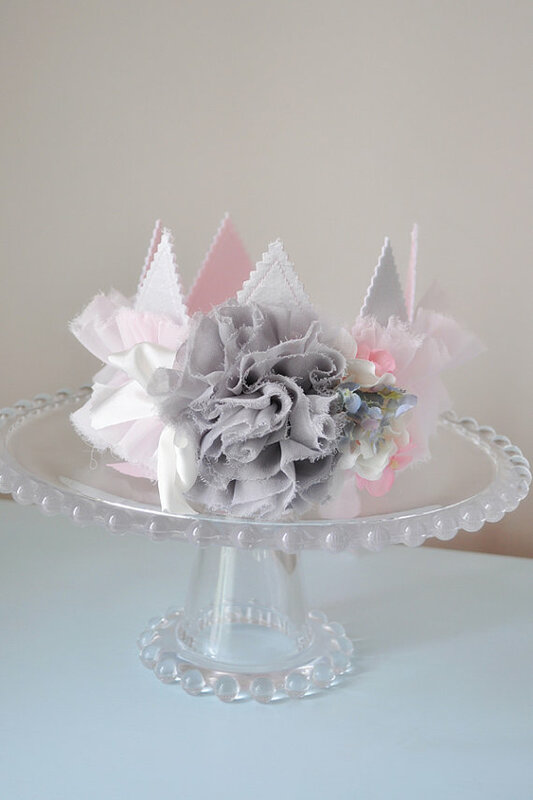 Gosh what little girl (or even big girl!) 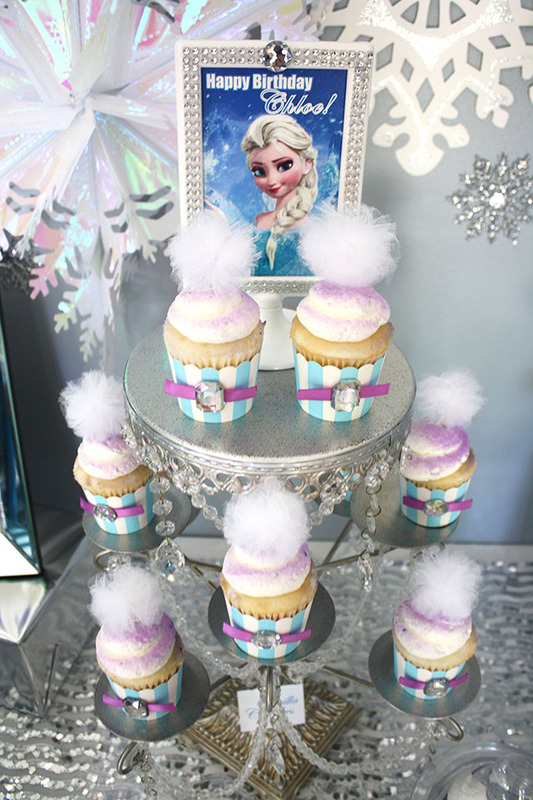 doesn’t love Frozen theses days and we are so in love with it too. 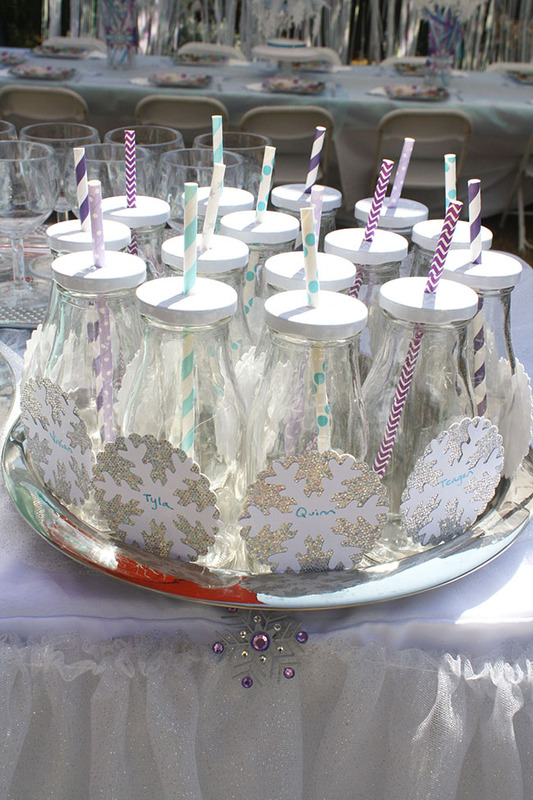 This 8 year old birthday party is chalk full of some seriously lovely details. 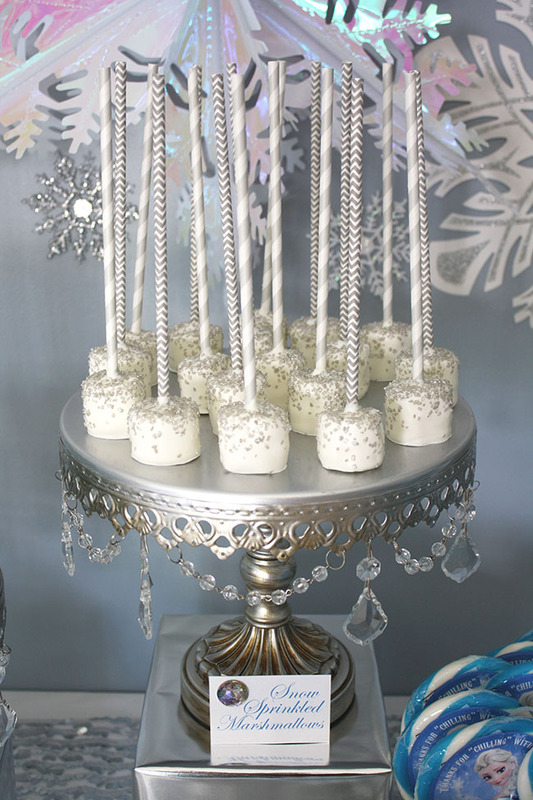 From the amazing treats of cake pops, pretzel rods, marshmallows, cupcakes and the fabulous Frozen birthday cake we would dig right into this dessert bar if we saw it. 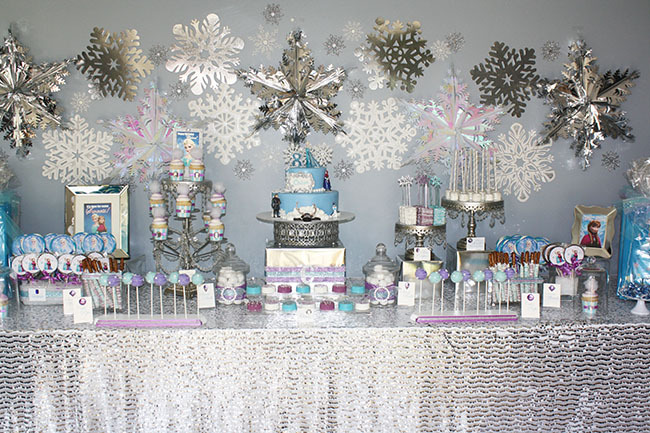 There are some seriously lovely decorations too like an all snowflake backdrop and a snowy tree dangled with rocky candy. 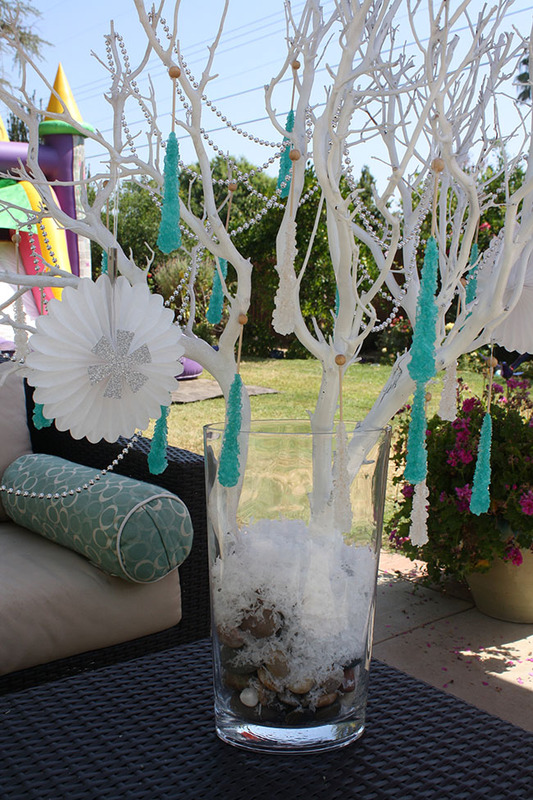 We can’t wait to show you all of these lovely details of this frozen party! 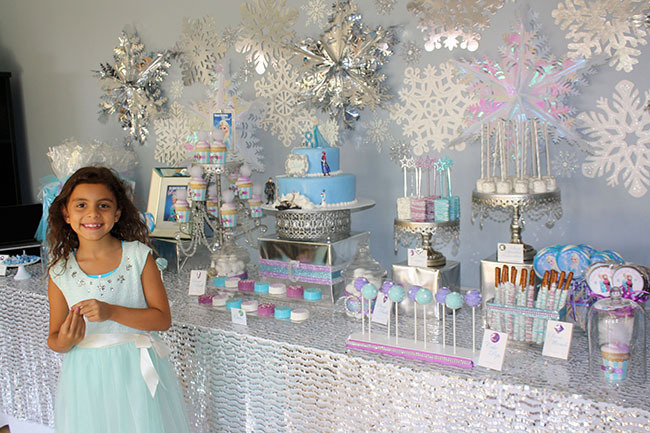 Disney’s Frozen phenomenon is still at full strength and going strong! 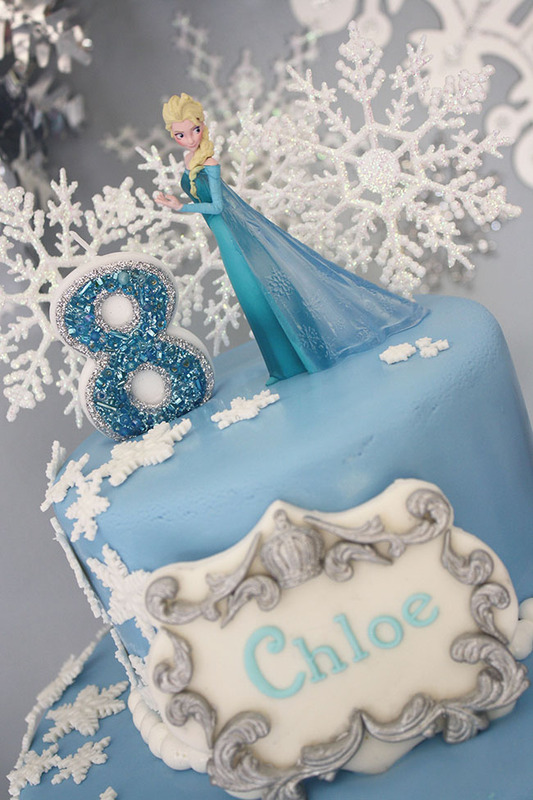 This Frozen themed party was for a little princess named Chloe, celebrating her 8th birthday. 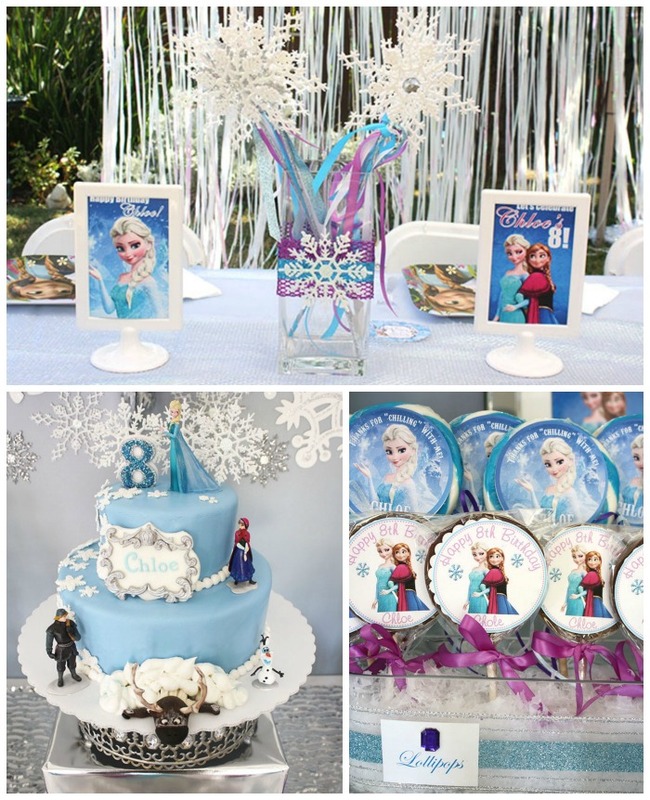 Of course, a Frozen themed party without Elsa, Anna, Kristoff and Olaf just wouldn’t be right; therefore, this party started off with life size standees welcoming all guests upon their arrival. 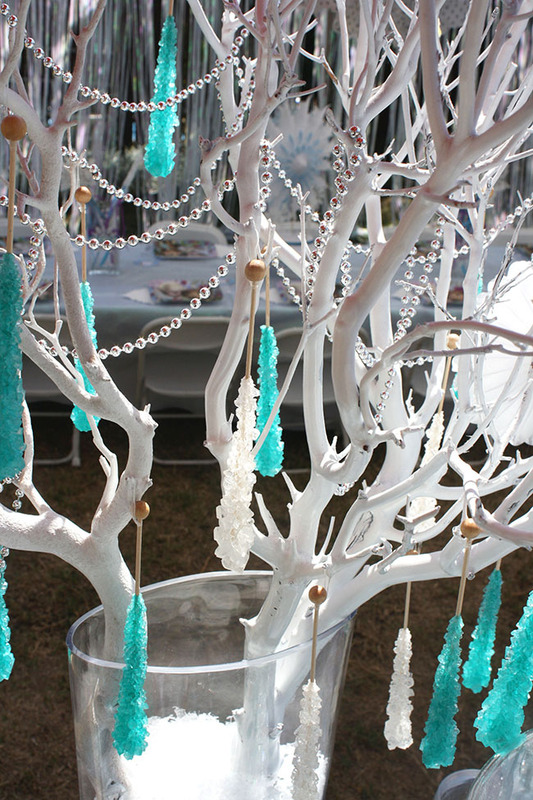 Each little girl received a custom made wand and a Frozen tee-shirt, just to name a few surprises. 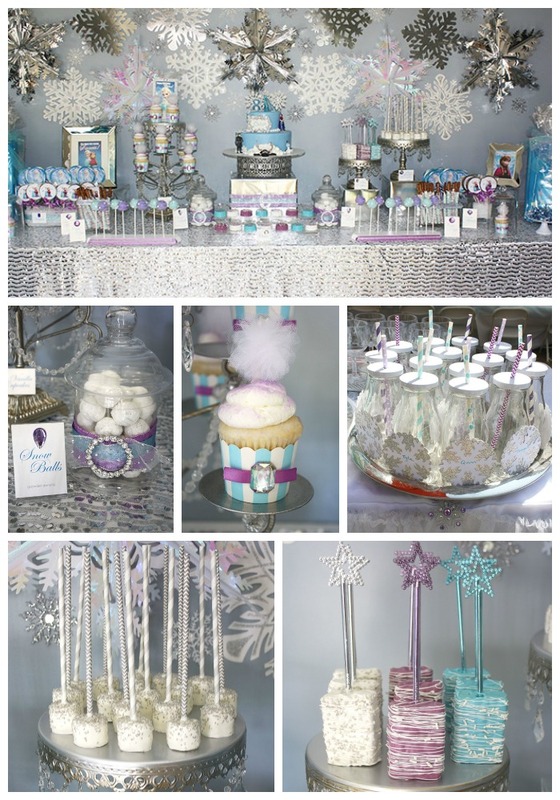 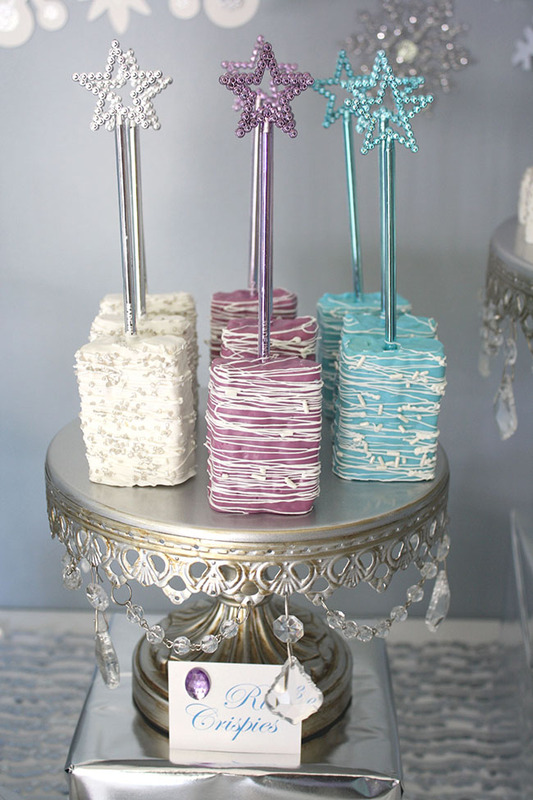 A princess party is no party without sparkle; so, I designed the dessert/candy table with lots of it! 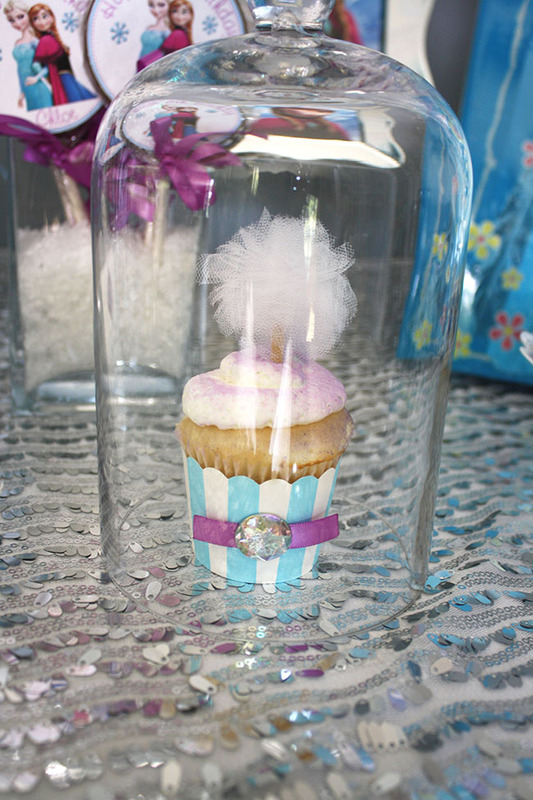 Adding “bling” to all the jars and stands, along with the coordinating custom made desserts, pulled the look together. 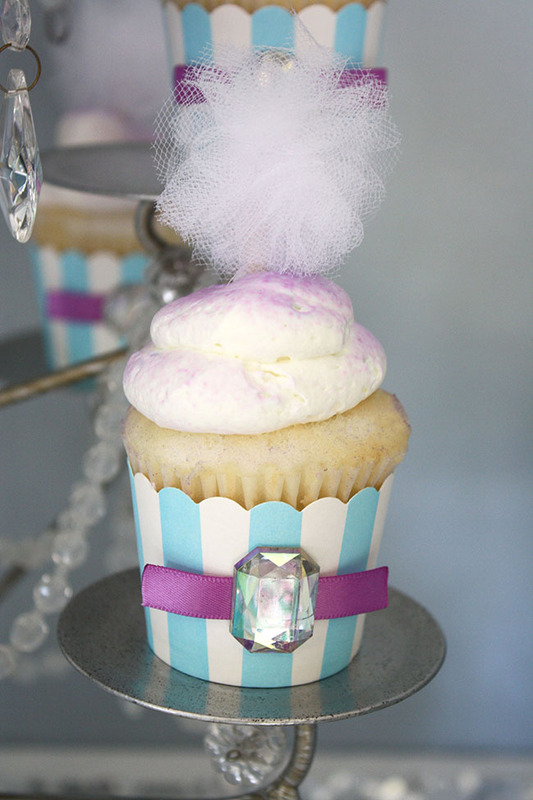 Oh and let’s not forget about the cupcakes….decorating the candy cups by adding the jeweled bows and topping them off with tulle pom-poms was a big hit.